The outlet, called the Dessert Bar, will offer a range of deserts, including mini pancakes, brownies, cakes, muffins and ice-creams. It will not offer any savoury food. The move comes as Burger King looks to offset flagging sales by diversifying its portfolio. It recently announced that it was to launch its first full value menu in 2011. 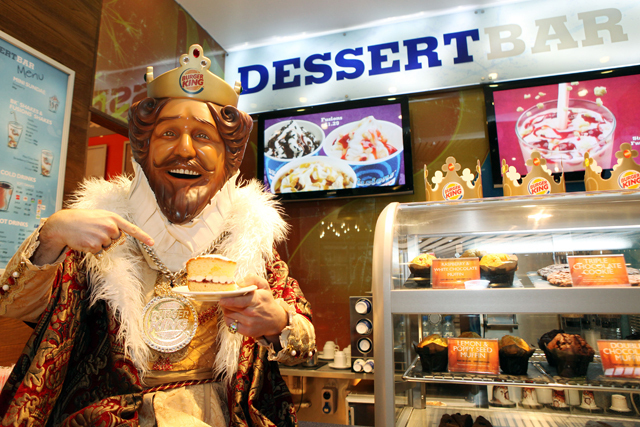 The Dessert Bar, based in a West London shopping centre rather than the central shopping district, is only the second outlet of this ilk that Burger King has opened in Europe. It previously opened one in Benidorm, Spain. The new offering is aimed at luring in both new and existing customers. Should Burger King make a success of this foray into tailored dessert bars then it could spell a roll-out across the rest of the UK. But Burger King said it was too early to make a decison. Burger King’s core fast-food outlets offer a range of deserts including BK Fusions caramel fudge and BK Fusions strawberry cheesecake. Rival McDonald's has specifically designated dessert queues and zones in the US.